Save £300 on used and delivery-mileage cars at Arnold Clark from 26th November to 18th December 2018. The UK’s best used car deals just got better. 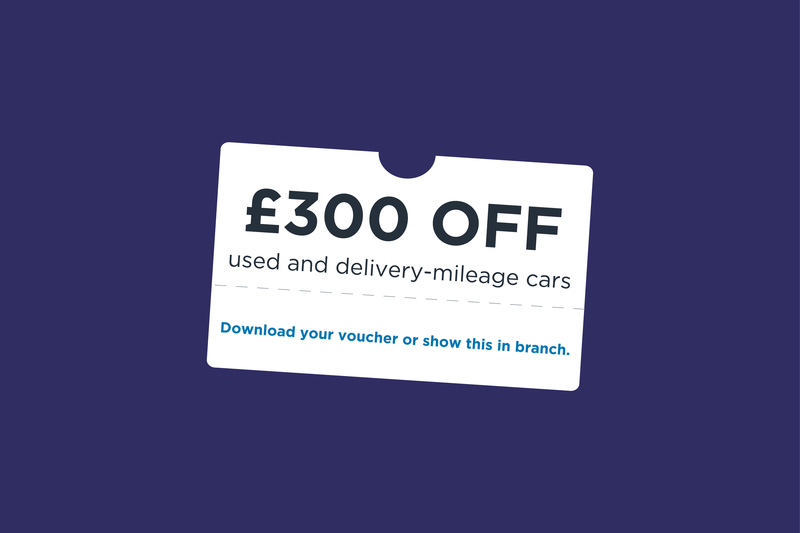 We’re offering £300 off used and delivery mileage cars. The voucher can be redeemed on over 20,000 cars at any branch from 26th November to 18th December 2018. To take advantage of this offer, simply download your voucher here. You can either show your downloaded voucher to one of our friendly product consultants on your phone screen, or print off the voucher and bring it in to your local branch. You can also redeem the saving on our Value Range cars, which are all priced below £6000! 67 Volkswagen Golf 1.0 TSI S 5dr – from £11,988. 68 Renault KADJAR 1.3 TCE Dynamique Nav 5dr – from £17,498. 68 Hyundai i10 1.0 SE 5dr – from £8998. 68 Kia Sportage 1.7 CRDi ISG GT-Line 5dr – from £20,998. SEAT Ibiza 1.0 SE 5dr – from £10,498. Terms and conditions: Calls may be recorded for quality and training purposes. Models shown for illustrative purposes. Cars advertised are available at branches listed or from Group stock and are subject to availability. Offers subject to status, terms and conditions. One voucher per car. Excludes: New car sales, fleet, Motability, Alpine and Harry Fairbairn. Cannot be used in conjunction with any other offer. Voucher must be presented on the premises when signing for the vehicle. For remote purchases, the voucher must be applied when placing the order and signing the agreement. Offer starts 26.11.18 and ends 18.12.18.